Journalists have a serious, serious PR problem. 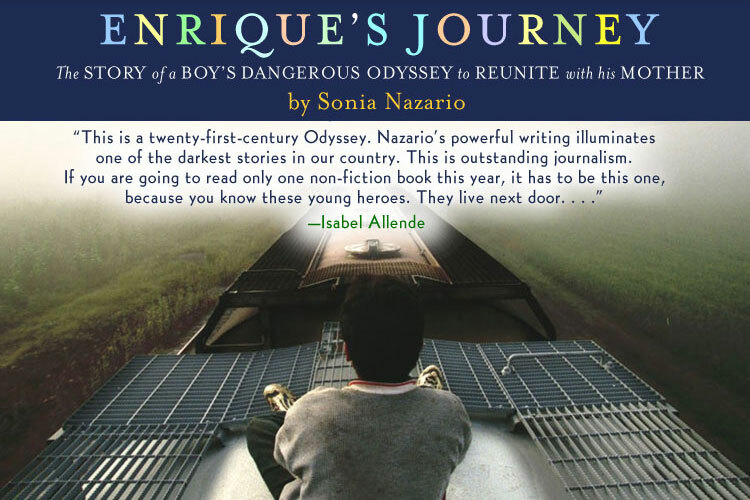 Enrique’s Journey is the story of a boy whose mother had left him at the age of five to travel to the United States. Nazario, a reporter for the Los Angeles Times, spent months documenting Enrique’s search for this mother, particularly the deadly immigrant path across the Texan border via train tops. She won a Pulitzer Prize for the series as it ran in the newspaper and turned the whole thing into a riveting book. In my talk to the high school students, I focused on how journalism can be broken down into myth, chronicle and story (which comes from several scholars but most notably Bird & Dardenne’s seminal work in the Social Construction of News). I talked about why stories are often framed the way they are, and how news accounts are woven using mythic qualities and chronicling motivations. I emphasized how good literary journalism teaches, that we can grow from a good story about the truth, and that we can vow to be better people because of it. After the students spent an hour discussing the book in Socratic groups, the final speaker took the microphone to caution students about the power of media and specifically, how journalists often misrepresent or completely ignore the plights of immigrants. She ended with this last. I was interested in this in particular. I agreed that students need to learn how to be media literate. I agreed that reporters can only tell part of any story (it’s hard to include every part of every event in just a few words or minutes of video). But a whole lot of questions buzzed around in my head: Why did she think journalists were trying to fool her? Is she conflating “media” with “journalism?” How would people go about “making their own realities,” exactly? (And a press theorist cannot help but be reminded of Walter Lippmann’s “picture in our heads” essay that described how the press is responsible for forming people’s view of the world they could not see). I saw students nodding during her talk, and I hoped they would not go away thinking about journalism along the same lines. I understood the frustration, particularly for minorities who are often portrayed as stereotypes or completely absent in news accountings. But journalists like Nazario, who travelled on those trains to relay Enrique’s journey across the border, risk their lives to tell stories so people can learn and understand others’ experiences. And there are some great ones out there. These students were nobody’s fools. And they learned all of this from a journalist.